Early this morning a snowy blizzard freakishly appeared and reminded me of twenty three years ago when we were living up in the ‘great white north’ of Alberta in Canada. I was uncomfortably overdue to have another baby. The weather had been balmy. April showers had already brought May flowers. I recall beautiful spring weather. I’d been catching some late afternoon rays as my kids played out in the sunshine. Suddenly (well, on the next day anyway), a wintery storm hit. It was a major blizzard, in fact. Wild. And cold. And then it was gone. Just hours ago, there was snow everywhere outside. I just looked out again, and it’s all green again. Snow flurries of today brought back memories of snow of yesteryear (which strangely does seem like just yesterday) and so brings me to my favorite snowman that I decided to share here. My youngest three conjured him up. Well, my youngest son came up with the story and my daughters illustrated to bring the snowy fellow to life. What follows is most of my motherly review that I wrote for Amazon a while back. Now, first I will admit to being possibly a fraction biased being that I am mother to these three wonderfully warm and talented young people, but, I shall still try to give a fully honest and fair review… at least from my own personal perspective. I found this story delightfully warm and the art beautifully wonderful, even after seeing it unfold before my eyes over the course of at least many months. It truly reflects its creators. Josh, Anna and Brina have enjoyed many congratulatory bravos and kudos from young and old through emails and personal contact relative to their first published creation. We have been told many times over that little kiddies (particularly two to ten year olds) do not wish to put the book away or up on a shelf once they have perused through it, and that it is carried around by the youngsters instead, as well as being requested as a nap and bed time story of choice. Some little folks in lands where it snows are noticing chilly snowmen everywhere during their winters, all hoping that each cold fellow will find warmth through the help of friends or family. 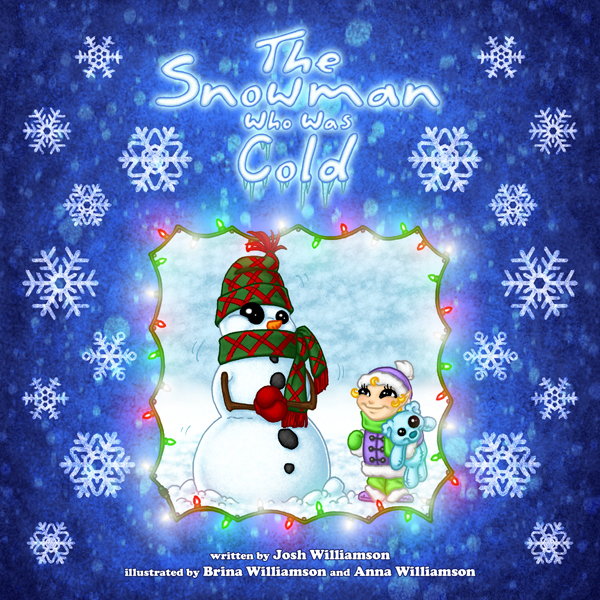 This story of a snowman who can’t seem but to feel cold and a loving little girl and her parents who find a way to warm him up, will warm you inside as well.